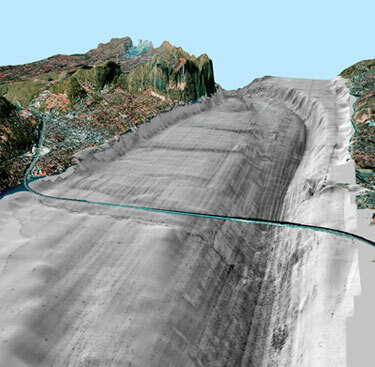 A three-dimensional image of the bottom of the Hudson River Estuary, New York extending from Tappan Zee to Croton Point (courtesy of Frank Nitsche and Roger Flood). The image was constructed from high-resolution multibeam bathymetry and side-scan sonar as part of the Hudson River Benthic Mapping Project funded by the New York State Department of Environmental Conservation. The project is a multidisciplinary effort lead at Lamont by Robin Bell, Suzanne Carbotte, and William Ryan in collaboration with Lamont scientists, students, and staff. The image extends for 10 km to the NNW. 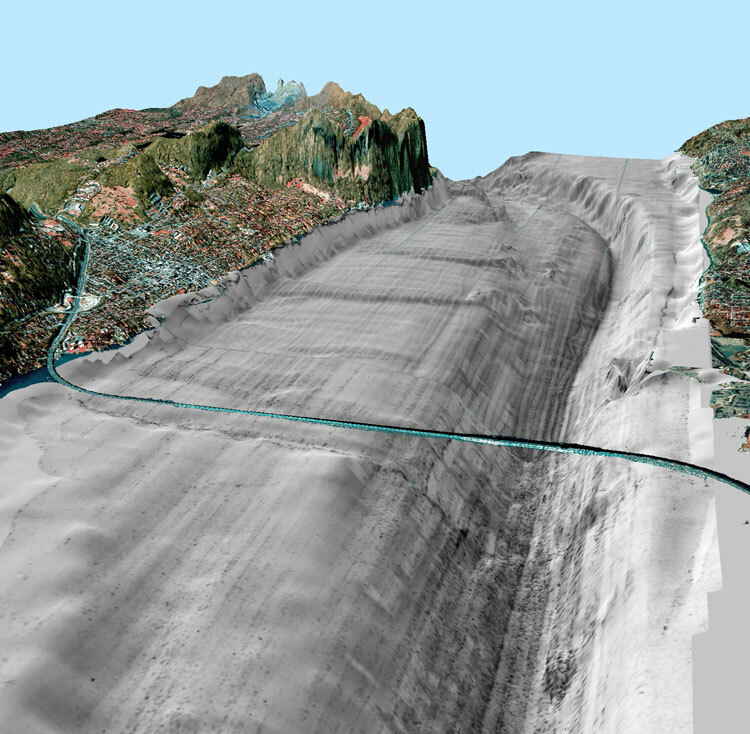 A sidescan sonar mosaic draped on top of the bathymetry surface provides information on a 15 m deep channel, 3 m deep subtidal flats, and on the surface character of the sediments (vert. exag. 50 times). Dark gray, high backscatter areas represent rough or hard surfaces while low backscatter (light gray) indicates softer or smoother sediments. Sediment cores collected from the region show that this segment of the estuary is dominated by sedimentary bypass except for a zone of sediment trapping along the channel bend to the north of the image. New York State aerial photographs draped on top of the USGS digital elevation model (vert. exag. 5 times) relate the riverbed to the surrounding landscape. Note the Tappan Zee Bridge across the river to the south. Click here to enlarge the image . The Hudson River Estuary, a stretch of the Hudson River from Troy, N.Y. to its mouth in New York Harbor, has begun a new stage of its life say geologists at Columbia University's Lamont-Doherty Earth Observatory and Queens College in Flushing, N.Y. Researchers at both institutions have found that, aside from a few very specific locations, the estuary may have largely stopped filling in with new sediment. "The Hudson has gone through many stages of evolution," said Cecilia M. G. McHugh, the lead scientist on the study being published in an upcoming issue of the journal Geology. "Now it's entering a new phase." Some new deposits are being laid down as a result of annual rise in sea level, McHugh continued, but on the whole, the river is at equilibrium. Every year the Hudson tributaries to the north discharge sand and silt into the river. The sand is trapped around islands and shoals near Kingston, while the silt washes down into the Hudson River Estuary, filling areas where scouring or dredging has occurred. Most of the silt is being trapped in a section of the river near the George Washington Bridge known as the Estuarine Turbidity Maximum (ETM). A small amount of silt is also being washed out to areas around the mouth of the Lower New York Bay. The valley that the Hudson River occupies is a deep gouge in the bedrock that geologists believe was formed over the course of tens of millions of years. During the last glacial maximum nearly 18,000 years ago, the valley was filled with ice from the Laurentide glacier. As the glacier receded, ice and melt water formed a series of interconnected lakes in the valley that eventually merged to form the Hudson River. The valley filled with river sediments for nearly 3,000 years until sea level rose and the river merged with the encroaching Atlantic Ocean forming the Hudson River Estuary. The estuary, the section of river where river and ocean water mix and that rises and falls with the tide, formed nearly 6,000 years ago. In places, sediment deposits beneath the estuary are more than 700 feet thick. Previously it was thought that this process of sedimentation was continuing today. However, McHugh and her colleagues believe that accumulation ceased some time in the last 3,000-1,000 years. The researchers examined more than 100 two-meter-long sediment cores taken from the estuary and bay as well as high-resolution sonar and seismic imagery of the bottom. They found that the current rate of sedimentation in the estuary as a whole is approximately 1mm per year  about the same rate as sea level rise, which, together with scouring or dredging are the only processes that are providing space for new sediment in much of the estuary. Of the estimated 1.2 million to 5.6 million metric tons of silt and fine sediment that wash into the river each year, about 300,000 metric tons is trapped in the ETM  the place where friction between seawater and river water creates turbulence that causes fine sediment to drop out of suspension. Currently, the ETM is centered roughly at the George Washington Bridge, but its daily position is influenced by the tides and the strength of the river current. If sea level ever stopped or reversed, said McHugh, the ETM could push all the way out into the mouth of the river and we could see the formation of an entirely new  a Hudson River Delta. About 50,000 metric tons of fine sediment is trapped every year in bays and bends of the river as well as on the river bottom in the Hudson Highlands where the river is narrow and most of the natural scouring occurs. In many places, only scouring of the river bottom caused by current and tides or human dredging is creating space for an appreciable amount to accumulate. As a result, said McHugh, these localized areas of new accumulation offer the potential for pollution to concentrate, creating toxic "hot spots" in the river bottom. A small amount of sediment carried by the Hudson is flushed out into the Lower New York Bay and settles at Sandy Hook Bay in New Jersey, where it accumulates at a rate of about 5mm per year. McHugh said she had a flash of insight several years ago that something about the river must have changed when she saw sediment cores that displayed unusual scouring marks at the top and found localized accumulations of new sediment next to large expanses of old sediment. "That's when I thought of the Hudson as a bathtub filled with sand," she said. "Only if it's scoured out can you fill it with new "
The research was supported by the New York State Department of Environmental Conservation, the Hudson River Foundation, the Lamont-Doherty Climate Center, the City University of New York, and the National Science Foundation. The Lamont-Doherty Earth Observatory, a member of The Earth Institute at Columbia University, is one of the world's leading research centers examining the planet from its core to its atmosphere, across every continent and every ocean. From global climate change to earthquakes, volcanoes, environmental hazards and beyond, Observatory scientists provide the basic knowledge of Earth systems needed to inform the future health and habitability of our planet. For more information, visit www.ldeo.columbia.edu.